Provided funding for a Doctors’ Training Seminar for Sleeping Sickness sponsored by the Association Against Trypanosomias in Africa held in Lisbon, Portugal. Provided funding for the publication of educational materials on Sleeping Sickness for villagers in Chad and the Sudan. Published a Resource Guide and Chapter Charter for all Chapters of KFWH. Published a Newsletter for Outreach to communities. Produced two professional films on the founding of Kids for World Health. Created a Lending Library for students, teachers, and community members. Hosted and sponsored an EXPO for community and doctors on neglected diseases, highlighting a distinguished panel of experts including doctors from WHO, MSF, and experts from the global health field. Hosted and sponsored an EXPO with John Bul Dau, Lost Boy from the Sudanese War, presenting a premiere of his film, “God Grew Tired of Us”. Presented speeches and power point presentations to many groups including churches,temples, schools, Knights of Columbus, Rotary, and Boards of Education on the mission and work of Kids for World Health and Neglected Diseases. Presented formal presentations to political figures on neglected diseases and the work of Kids for World Health including those to former Senator Hillary Clinton, First Lady Laura Bush, Congresswomen Jan Schakowsky and Nita Lowey,Senator Chuck Schumer, The Secretary of State Department Office/ Sudan Division, The Under Secretary for Domestic Policy at the White House, and the Sudanese Ambassador to the United Nations. Presented formal presentations to institutes and scientists including Dr. Cyrus Bacci, discoverer of a cure for Sleeping Sleeping Sickness; Dr. Peter Hotez, Professor and Journalist on neglected diseases at George Washington University and Director of the Sabin Vaccine Institute; and Alice Albright, Director of the GAVI Institute in Washington,DC. Educated tri-state educators on the Kids for World Health organization and its mission at the Channel 13, “Celebration for Learning” Exhibition in New York City. Held a press conference on the Mall in Washington, DC for nationwide television. Appeared on Channel 12 News, “Making a Difference”; Current Science Magazine, MSF, page 7.Educational Magazine, The NY Times, and in various newspaper featured articles. Chapter Level Activities include speakers such as Dr. Renee Ridzon, Senior Program Officer at the Bill and Melinda Gates Foundation; exhibits; power points; and important efforts to support education and awareness. Provided Advocacy presentations for the elimination of Chagas Disease in coordination with WHO. Created an on-site student internship program in Bolivia on the treatment of Chagas with the Center of Disease Control. Hosted Fifth Community Event : Understanding Human Partnership with John Dau and panel of Global Health Experts. Planned school programs with speaker, Dr. Patricia Dorn, Professor of Biological Sciences,Loyola University, New Orleans. Constructed and established a KFWH Pediatric Ward for treatment of Sleeping Sickness and Malaria servicing 90 villages in the region of Yei, Sudan. Provided funding for research for the development of improved drugs for Sleeping Sickness. Construction of a fully equipped kitchen for a 100 patient hospital in Yei, Sudan. Provided funding for an equipped laboratory within the clinic in Yei, Sudan. Provided funding for a KFWH Pediatric Ward at the John Bul Dau Clinic for the treatment of neglected diseases servicing potentially 150,000 villagers in Duk County, Sudan. Provided funding for a KFWH Pediatric Ward servicing 50 villages in Kaliua, Tanzania for the treatment of Sleeping Sickness. 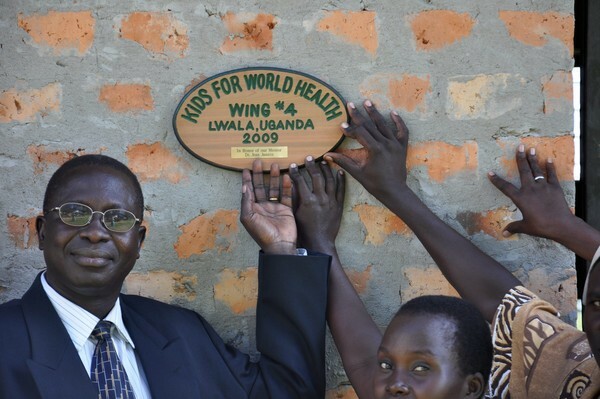 Provided funding for a KFWH Pediatric Clinic in Kampala, Uganda for the treatment of sleeping sickness and malaria, servicing potentially 250,000 villagers. Provided funding for a KFWH Pediatric Clinic in Bodo, Chad for the treatment of Sleeping Sickness, servicing potentially 150,000 villagers. Provided funding for a Doctors Training Seminar for Sleeping Sickness sponsored by the Association Against Trypanosomiasis in Africa held in Lisbon, Portugal. Provided funding for the construction of a Pediatric Clinic in Lwala, Uganda, servicing potentially 150,000 villagers. Provided funding for the construction of a Pediatric Clinic in Bodo, Chad servicing potentially 150,000 villagers. Provided 400,000 dollars worth of much needed O.R. equipment and supplies to Lwala Hospital in Uganda with Project Cure. Provided funding for introducers and leads for pacemaker surgeries in the treatment of 4th stage Chagas in Bolivia. Provided funding for renovation of our KFWH Pediatric Clinic in South Sudan. Provided nutritional packets for those women being treated for Chagas in Guatemala. Provided materials for home improvements for 144 houses in villages in Guatemala. Provided materials for animal pens for the prevention of Chagas in Guatemala. All Actions are recommended/and or approved by our Advisory Team on Neglected Diseases. Decisions on KFWH Actions for any given school year are made by the Student Policy Board. After the budget has been determined for an Action, Kids for World Health directs 100% of the funding for this project toward its completion. Expanded our chapter memberships to include other communities in NY State, as well as chapters in other states.